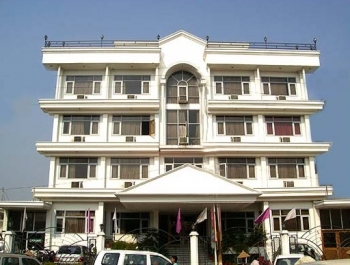 The Hotel Le Grand is situated at the heart of the Haridwar, the serene city with famous pilgrimages. The closest city to Le Grand is Rishikesh which is popularly known for the yoga and meditation facilities. The hotel offers luxury amenities for the comfort of the guests. The Le Grand Hotel is easily accessible to the travellers at a walking distance of 2.5 km from the railway station and local bus stand. Har ki Pauri is just 4 kms from the hotel. Le Grand Hotel offers well appointed and well decorated rooms to the guests. The rooms are provided with the modern amenities required for a comfortable stay. The rooms are provided with attached bathrooms with twenty four hours supply of hot and cold water. 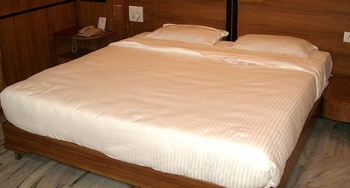 There are 32 air conditioned and air cooled rooms which are carefully designed and luxuriously furnished. Each one with cable T.V. and telephone with direct dialing facility. Host - The Multi cuisine Restaurant air conditioned at Le Grand Serves pure vegetarian - Indian , chinese and continental cuisine. It has an enchanting ambience, enhanced by excellent, unobtrusive service. And to provide the perfect ambience for a dining out experience, our restaurant serves mouth savoring delicacies round the year . Taj Banquet: Banquet is an ideal venue to host wedding Receptions Ring Ceremonies, Exhibitions and all kind of Social and Religious Gatherings. with a capacity to accommodate upto 500 people. Banquet hall is an ideal venue to host wedding Receptions Ring Ceremonies, Exhibitions and all kind of Social and Religious Gatherings. By Flight: In the region Air Services are available only upto Jollygrant airport in Dehradun which is 35 kms from Haridwar hotel Le Grand. By Rail: This major pilgrimage center has been well connected by trains to all the major towns of India. By Road: Haridwar, on the main highway, is connected to all major centres in the region and other parts of the country by road. There are buses available from Delhi to this place. Rishikesh is 28 kms and Mussoorie is 98 kms from the hotel.